The new ETX Powered Loudspeakers family builds upon the industry-leading innovation and 85-year heritage of Electro-Voice audio engineering to offer the most advanced professional portable powered loudspeakers available today. 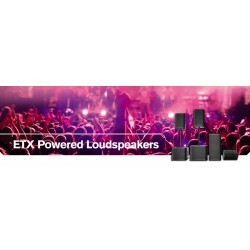 A versatile high-end choice for live entertainment venues, rental companies, pro musicians and DJs, and installed sound, the ETX Powered Loudspeakers family features three two-way models (10-inch, 12-inch and 15-inch, all with a precision HF titanium compression driver), a three-way model (15-inch with a 6.5-inch MF driver and a precision HF titanium compression driver) and two subs (15-inch and 18-inch drivers). Positioned above the ZLX and Live X families respectively, ETX Powered Loudspeakers complete a trio of recent EV portable loudspeaker offerings—each of which was designed to bring best-in-class performance to its price point. Inside each low-profile, tour-grade wood enclosure are a host of unique new features that set ETX Powered Loudspeakers apart, combining intelligent technology and innovative industrial design for spectacular results across all applications. EV-engineered high-efficiency transducers and high-powered Class-D amplifiers, Signal Synchronized Transducers (SST) waveguide design and smart FIR-Drive DSP all work together to provide peerless EV sound quality and precise coverage at the highest SPLs. ETX-10P10" Two-Way Powered LoudspeakerFeatures :10-inch LF SMX woofer1.25-inch HF titanium compressi..
ETX-12P12" Two-Way Powered LoudspeakerFeatures :12-inch LF SMX woofer1.25-inch HF titanium compressi..
ETX-15P15" Two-Way Powered LoudspeakerFeatures :15-inch LF SMX woofer1.25-inch HF titanium compressi..
ETX-15SP15" Powered SubwooferFeatures :15-inch DVX woofer for maximum punch1800 W Class-D power ampl..
ETX-18SP18" Powered SubwooferFeatures : 18-inch DVX woofer for extended low-frequency response1..
ETX-35P15" Three-Way Powered LoudspeakerFeatures :15-inch LF SMX woofer6.5-inch MF driver1.25-inch H..